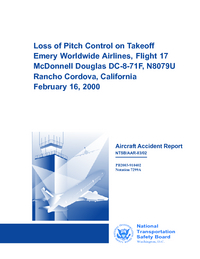 Emery Flight 17 had just departed Sacramento-Mather Airport runway 22L when the crew reported balance problems. A little later the aircraft was seen to crash in a left wing low, nose low attitude, into the Insurance Auto Auctions salvage yard, setting fire to 100-200 cars. Debris cut a swath about 250 yards wide and a 600yds long. The plane's cargo included clothing, transmission fluid and a small amount of 9 grams fuses used to activate automobile air bags. The NTSB is focusing on the possibility that a push rod in an elevator control tab may have been separated from the control system of the plane before impact. PROBABLE CAUSE: "A loss of pitch control resulting from the disconnection of the right elevator control tab. The disconnection was caused by the failure to properly secure and inspect the attachment bolt." Distance from Sacramento-Mather Airport, CA to Dayton-James Cox Dayton International Airport, OH as the crow flies is 3153 km (1970 miles).